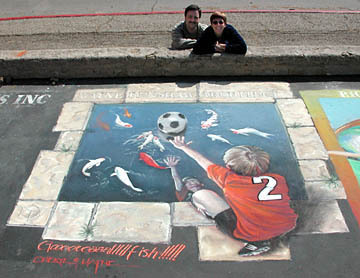 For our ninth trip down to Santa Barbara for the I Madonnari festival, we did an original painting of the interaction of a koi pond and a soccer ball. 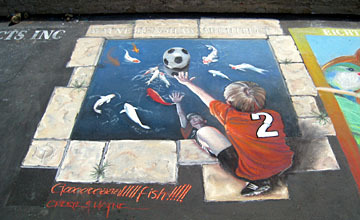 The soccer player is our nephew Nolan; the koi are played (mostly) by the fish from Santa Barbara's Alice Keck Park. The weather was the big story of the weekend. It rained Friday night, so we arrived Saturday morning to a scene of people drying their squares by any means possible. Later that day, we were treated to a brief 20 minute shower that dampened everything again. The rest of the time we were dry, but alternated between too cold and too hot (depending on whether we'd just removed or put on a layer of clothing). 8:00 AM Saturday morning. 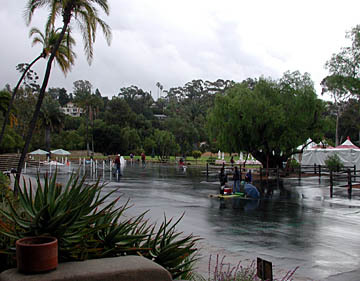 After the previous night's rain, people were using squeegees and towels to dry off their squares. 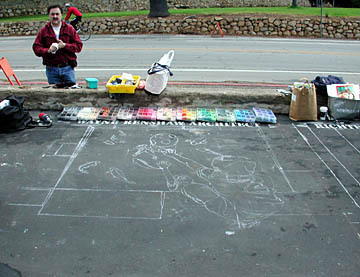 We toweled off the square and pounced the outline of our painting. Once the outline was in place, we started work on the koi pond water. In late morning, we started getting occasional raindrops on the square. 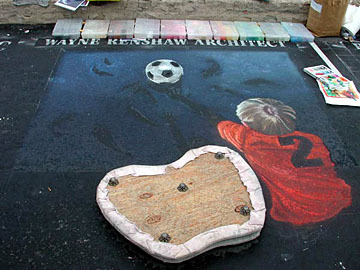 Wayne closed up all the chalk boxes and moved his seat off the square, where it was already starting to create a rain shadow (to the left of the soccer ball). 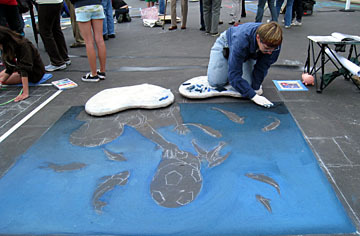 A light rain wouldn't create a problem for the artwork as long as it fell consistently across the entire piece. At around noon, the occasional drops grew less occasional, and we had to quit for a time. 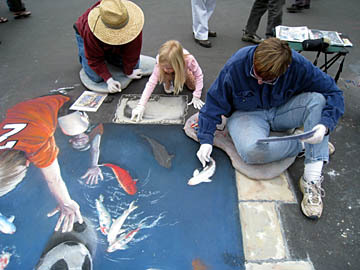 We put our current sets of pastels on one seat and covered it with the other to protect both the pastels and the seats, and watched the art get dark with moisture. After the rain stopped, we returned to work. We had some spattered color to clean up and an interesting texture from the raindrops hitting the chalk, but it was easy to clean up. 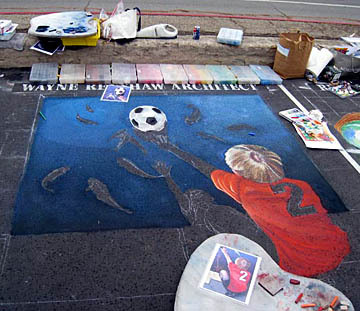 By the end of the day on Saturday, we'd gotten Nolan done (but not his reflection), the soccer ball, and the first three fish. 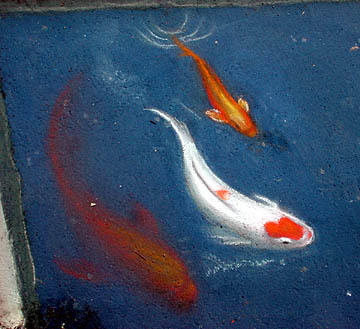 Closeup of the koi in the top left corner. 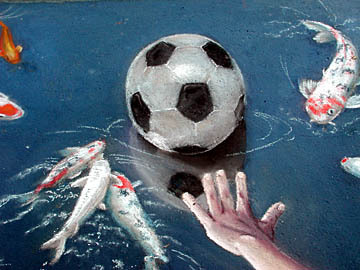 Closeup of the soccer ball (with scrum of koi and Nolan's hand). 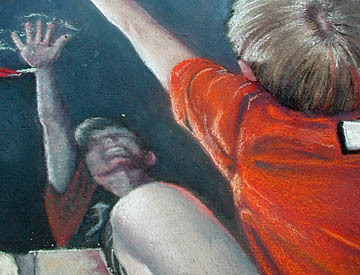 Closeup of Nolan and his reflection. Wayne's cousin Steve's daughter Megan was thrilled to help Wayne draw several stones. 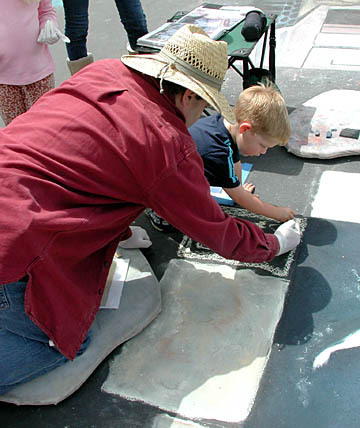 Wayne's cousin Steve's son Jack helps Wayne with some stonework. Almost done! 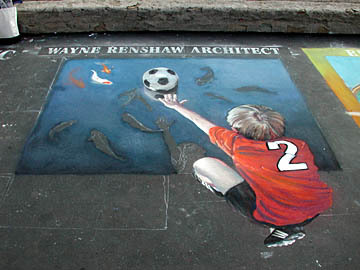 Wayne touches up the grass growing between the stones in the paving. 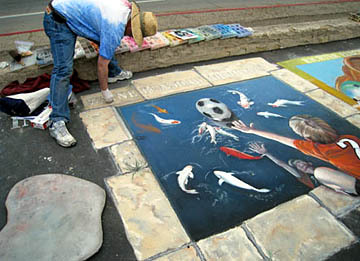 The completed square with the artists.